Homeopathy for the Herd was devised by Prof. Dr. Claudio Martins Real, veterinarian. His first contact with homeopathy was in childhood and influenced by his father, Francisco Real. Claudio Real was born in 1926 in “Capão do Leão” town in Brazil, at the time, 4ᵗʰ District of Pelotas, graduated in Veterinary Medicine at the School of Agronomy and Medicine of UFRGS. At the age of twenty-four, he became the youngest professor of the country. 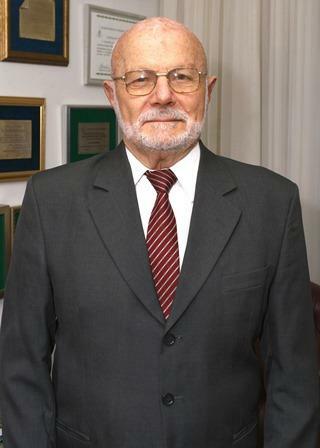 He worked as a professor at UFRGS until 1981, when after retiring he applied to the Federal University of Mato Grosso do Sul, where he worked until mandatory retirement. Since then, Prof. Claudio Real is dedicated to Real H Company, along with their children. Title of Professor Emeritus of UFRGS. The indication of this honor, was the initiative of the Veterinary College’ director, Emerson Contesini, which considered the remarkable trajectory of honored as a teacher, researcher, entrepreneur and pioneer in activities at UFRGS and class societies, promoting the broadening knowledge of his area. Title of Campo Grande citizen granted by the city council of Campo Grande in recognition of the services rendered in order to improve the quality of people’s life and the city’s development. On the Day of the Portuguese Community (June 10ᵗʰ) was honored as descending Personality in recognition of the services rendered to the Campo Grande society. Title of “Forerunner of Veterinary Homeopathy in Brazil” given by the Brazilian Medical Association Veterinary Homeopathic. Honor of “Commendation of Merit of the Brazilian Veterinary Medicine”, awarded by the Brazilian Society of Veterinary Medicine, in recognition of the work performed throughout his profession. Saturdays* from 7:30 a.m. to 11:30 a.m.
© 2015 Real H Animal Health and Nutrition. All rights reserved. Cnpj: 00.988.303 / 0001-64. Prices, promotions, delivery charges and payment terms informed on the site are valid only for purchases via the Internet linked to the stock availability. Real H reserves the right to correct or change information and prices at any time.